I love spending time in the kitchen making risotto, I find it so relaxing but that endeavour is without doubt a weekend pursuit. During the week, after a long day, kids screaming at me for dinner and the cat racing around under my feet (I think purposefully) trying to trip me up the last thing I feel like doing is spending 30 minutes standing over the stove slowly stirring a pot at a pedestrian pace. I do feel like spending 10 minutes on prep and having a big pot of comforting risotto for dinner (and a glass of wine, of course). Hello Oven Baked Risotto with Saffron and Chorizo. On Mother’s Day this year my sister-in-law, mother-in-law and I decided, over a bowl of risotto, that we needed a good oven baked risotto recipe. I saw that as my challenge. I’ve made them plenty of times in the past but they have always turned out stodgy and more like a pilaf than a silky risotto. Now I do admit, this is technically not a risotto but it’s delicious and it’s pretty darn close. So, again I must beg for forgiveness from any die hard Italians foodies reading my blog. Like my Cabonara, my Oven Baked Risotto is delicious but I’m sorry it is not traditional. But does it matter? 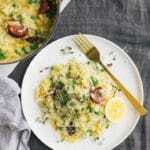 It is creamy, it is silky, the rice has a bit of a bite and it is almost soupy in texture – everything you want from a risotto, but it’s oven baked. What rice should I use in a risotto? I am a total geek so we are going to have a little chat about types of rice you can use in risotto. It really makes all the difference. I totally get that 99 percent of the population are far cooler than I am and probably want to do cool things like walk around wearing sunglasses and drinking kombucha. So if you don’t want to geek out right now skip right ahead two paragraphs, but I do warn you, your risotto may suffer out of your coolness. There are three main types of rice you want to use for risotto: arborio, carnaroli or vialone nano. Vialone nano is less common and usually used for lighter risottos such as seafood ones. I’ve never even seen this at my local gourmet supermarket, so we’re going to forget about this type. Let’s talk arborio. That’s your classic. It’s easy to find and relatively cheap. It is perfect for a risotto but it’s high maintenance and can easily overcook. Then there’s carnaroli. In the 1940’s arborio rice and a variety of Japanese rice, got married and had a baby and called it carnaroli. It is the most forgiving rice to cook with and makes a deliciously creamy risotto that still has great texture. 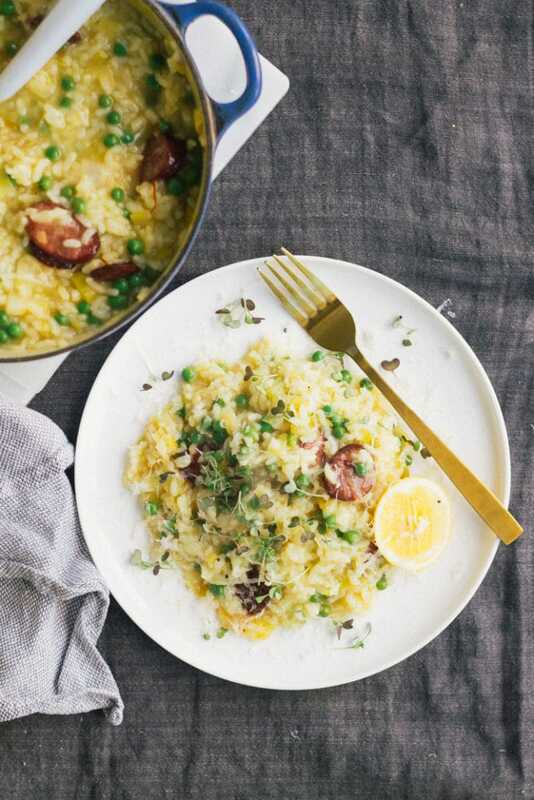 When it comes down to it, any risotto rice you can get your hands on will work for this oven baked risotto but carnaroli will give you the best result. 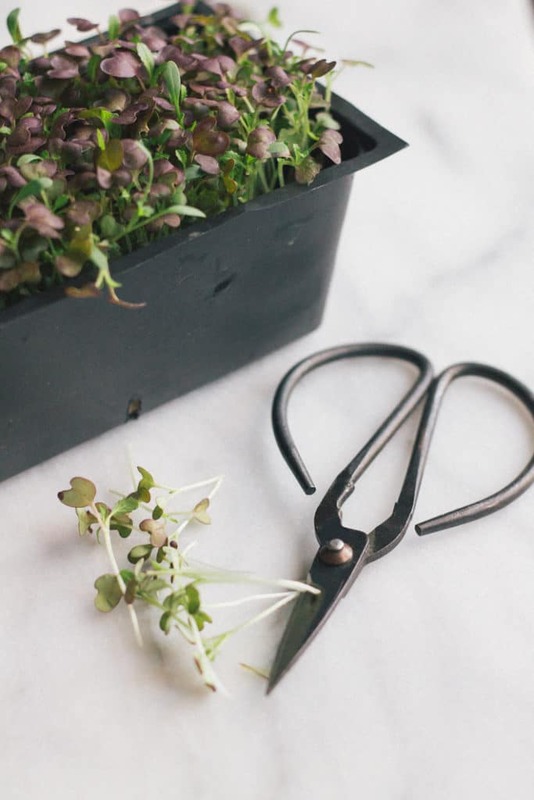 Why not experiment with the different types? Just don’t use long grain rice, jasmine, basmati etc. you get the drift and NEVER rinse your rice before cooking. We want all that starch because STARCH = CREAMINESS. Once you nail a risotto then you can really add any flavour combos you want. Again, I know chorizo and saffron aren’t traditional and have a Spanish bent but I think the spice and saltiness are so delicious in a risotto. 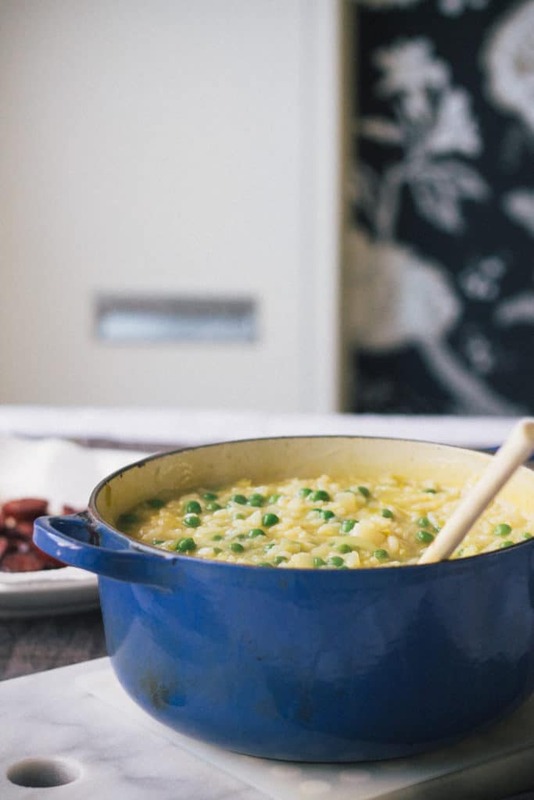 So add this to your weeknight arsenal and when all you feel like doing is sitting down with a glass of wine after a long day, commit to just 10 minutes of prep and you’ll have a delicious creamy risotto on the table (assuming the cat doesn’t trip you up on the way to the table, yes, this has happened to me..so messy). Remove peas from freezer and set aside in a bowl at room temperature. Thinly slice chorizo into 1/2cm/1/4in slices. Set aside. Slice the white part of the leek (discard the green part or use it for stock) in half lengthways. Give it a really good clean in cold water to remove any dirt or grit then finely slice across the leek. Set aside. Drizzle olive oil in an oven-proof saucepan or Dutch Oven (I like to use my cast-iron enamel Le Creuset pot for this) over medium-high heat. Add chorizo and cook for about 5 minutes until browning and starting to crisp. Remove with a slotted spoon and set aside on a plate lined with absorbent paper towels. Reduce the heat to medium, add sliced leek and cook until soft, about 5 min. Remove the pot from the heat and add garlic, saffron, chilli (optional), rice, wine, and 4 cups of stock. Cover and place in the oven for 15 min. Remove, stir, cover again and return to the oven for a further 10 min. Remove again, stir through the peas and cover. Return to the oven for another 5 min or until the rice is tender and the liquid is absorbed. When the risotto is cooked, remove from oven and stir through remaining 1 cup of chicken stock, 20g/0.7oz of butter and grated parmesan cheese and stir vigorously until creamy. Gently stir through the chorizo, or scatter on top. 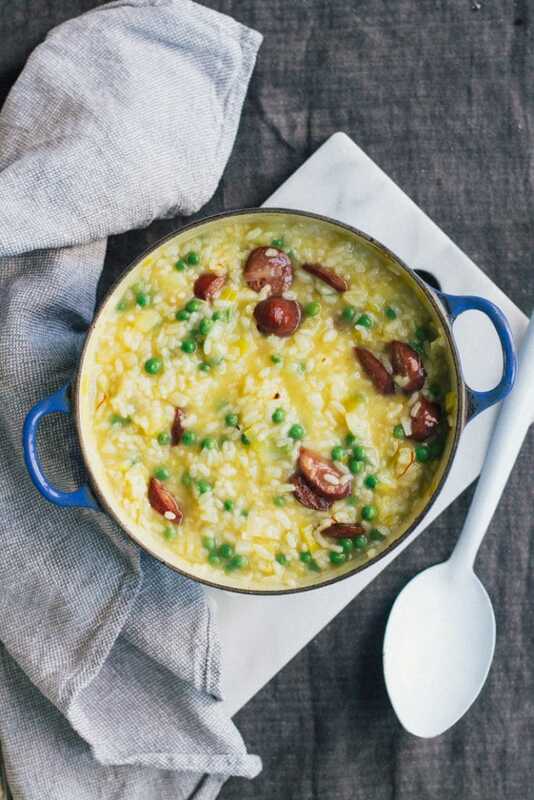 The residual heat of the risotto will heat the chorizo or if you like you can put it in an oven proof dish and place it in the oven for 5 min when you add the peas to the risotto. Serve immediately with extra grated parmesan cheese. Note 1. See blog post for more info on what type of rice to use. Any risotto rice is suitable but you will get the best result with carnaroli. Note 2. The alcohol does evaporate during cooking but if you prefer not to use wine then add 1 Tbsp of lemon juice before serving instead. Even if I do use wine I still like a little squeeze of lemon juice before serving too. 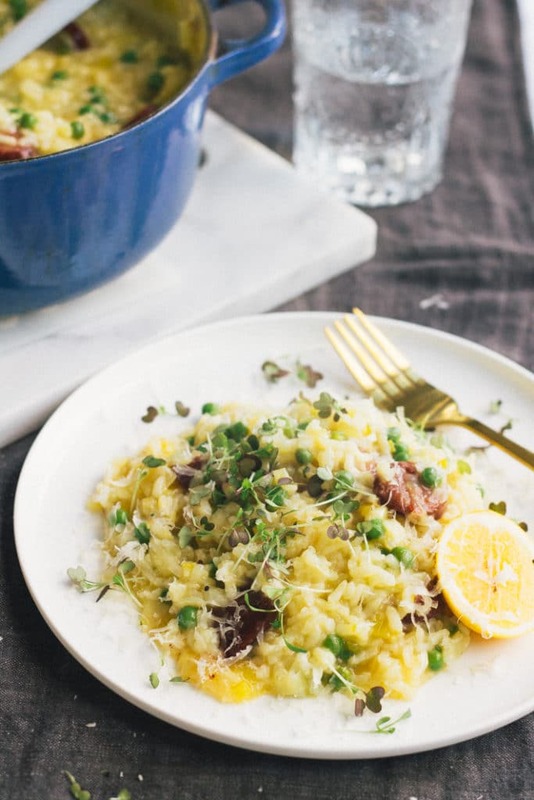 Hi Kate – Can I just say that your Risotto looks sooooooo delicious and your photography is simply beautiful. This is a must try for me. Thank you so much Cree for your lovely comment! I think I have a lot of work to do on my photography so your comment just made my day!